In order to put itself on the map as a global tourist destination, the Seoul Metropolitan Government has come up with a fresh tourism policy, mainly targeting international travelers. 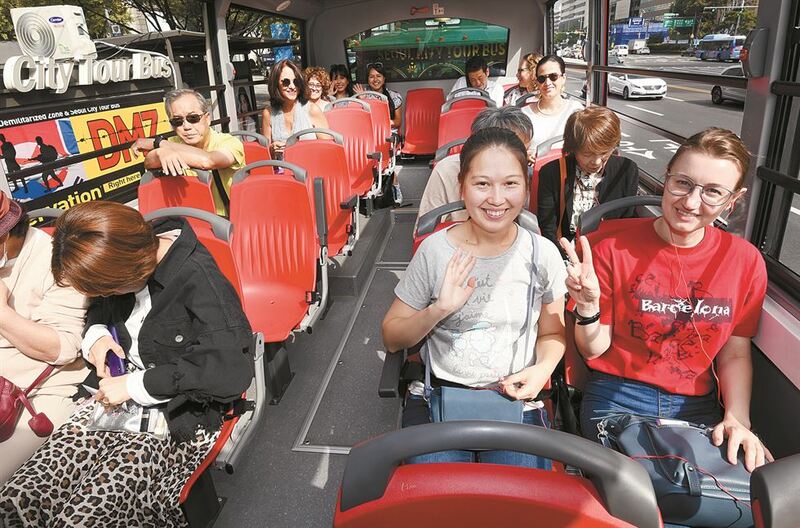 Seoul logged solid numbers of foreign tourists to the capital in each of the past two years ― 10.5 million in 2017 and 12.1 million in 2018 ― that both accounted for nearly 80 percent of the total overseas travelers to the country. This year, the local government aims to attract 13.5 million foreigners to the capital. However, compared with main cities in neighboring countries and others in the region, the capital of Asia's fourth-largest economy is still regarded as a tourism underachiever. In that respect, the city government plans to concentrates its efforts on inventing and expand distinct tourism content, while boosting its competitiveness in global tourism. "The new tourism policy is expected to contribute to boosting Seoul's reputation as a tourist destination," Joo Yong-tae, director-general of the city's tourism and sports bureau, said in a press briefing Tuesday. First of all, Seoul plans to promote peace tourism, taking advantage of improved inter-Korean relations. Within this month, the local government will form an advisory panel for inter-Korean peace tourism whose job will be focused on unearthing related attractions such as a peace forum that would discuss ways to encourage tours between South and North Korea, a photo exhibition about peace and harmony on the Korean Peninsula and a food festival featuring North Korean delicacies. In addition, the body will work to devise programs touring the demilitarized zone (DMZ) and the Joint Security Area (JSA) by May ― the best place for those who want to peek into the reality of the divided Korean Peninsula and view the pristine landscape. Seoul also plans to nurture three Vatican-authorized pilgrimage routes as major tourist destinations. The historic Catholic locations in central Seoul were recognized as international pilgrimage destinations last year. To this end, it will launch overseas promotions such as building up a network with other international pilgrimage sites and offer joint advertising. Two hundred and one guide signs on the ground will be installed and their surroundings will be improved. The city government will also be committed to coming up with more tour programs allowing foreign tourists to experience and learn about Korea's traditional food, K-pop and K-beauty to deliver the charm of the city. In addition, it will also focus on medical tourism offering high level medical expertise. While expanding its tourism content, Seoul City is also seeking to lay the groundwork to enhance its competitiveness. After becoming the third-largest convention city in the world from 2015 to 2017, now Seoul is seeking to sit atop the leaderboard. The lucrative meeting, incentive, convention and exhibition (MICE) industry is a fast growing sector. According to the Korea Tourism Organization, MICE participants spend 3.1 times more money and stay 1.4 times longer than tourists. In April, the local government plans to unveil its mid- and long-term development program for the MICE industry, while the Seoul MICE Alliance (SMA), a partnership between government agencies and companies in the industry, will improve stability in operations. Plus, the Seoul MICE Forum will be founded in July. In a bid to maximize its capability, Seoul City will set up Seoul Tourism Plaza that will place the Seoul Tourism Organization, foreign tourist offices in Korea and tourism startups together and serve as a hub for tourism. Its master plan will start within this year for completion by 2021. In addition, Seoul will open an online Seoul tourism channel on YouTube in March and develop 20 new sightseeing routes that will include historic and cultural attractions, filming sites of popular dramas and renowned restaurants.